When it comes to property maintenance, our Gorillas are experts at seeing the bigger picture. When your vision is a little spotty, call for our Sherwood Park window cleaning. For decades, Gorilla Property Services has been swinging into action for both residential and commercial properties, three storeys and under. Instead of household approaches like glass cleaner and paper towels, our Gorillas carry the most current tools of the trade. Sherwood Park window cleaning is a science! Gorilla technicians can do it all. Clients can rest assured in our service. Our Gorillas experience a rigorous training program before they are ever allowed to answer a client call. If you are curious as to why your Sherwood Park window cleaning needs a training course, allow us to explain! Carrying out your window cleaning on your own is not a ‘cut and dry’ chore. Streaks will be visible along the surface of your glass and dirt and dust will collect very quickly against your window. Our Gorillas use eco-friendly cleaning agents, along with rubber squeegees in order to eliminate any possibility of static build-up against the surface of your windows. 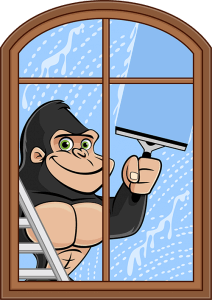 In the spirit of full-scale cleaning, our Gorillas are also available to do a full surface area clean of the surrounding area of the window. Our local techs leave no stone under turned when it comes to the overall well-being of your property. Clients can call together to speak with one of our experienced technicians about the benefits of our Sherwood Park window cleaning and how one call to Gorilla Property Services can mean a world of difference to your windows.